This entry was posted in Uncategorized and tagged Bangkok, Bridge, Nighttime, Skyline by christao408. Bookmark the permalink. beautiful – I enjoy the lights at night. I have to say these are very beautiful. Wish we had the same sense of esthetics in the US. Beautiful… I couldn’t help but think those would make great monthly calendar shots. Thanks for sharing! Beautiful bridges. So much change in the last twenty or twenty five years since I visited that place. The bridges are majestic, especially the Rama VIII. Can’t help but wonder, how to pronounce all those names. @Inciteful – Narathiwat = “Na-ra-ti-wat”, Sathorn = “Saa-torn”, Rama = “Ra-ma”, Chao Phraya = “Chow Prai-ya”. @ZSA_MD – @oxyGENE_08 – Very true. In the past few decades, Bangkok has really grown up as a world class city with some beautiful architecture. I suspect all the capitals of ASEAN will follow the same path eventually. @vinimanilli – So glad you enjoyed your visit here. @Passionflwr86 – Bridges of Bangkok – the new calendar! =D@murisopsis – Well, so often we are more concerned with cost and don’t consider the value of beauty. Not like the days of great public works back in the 30s when the Golden Gate bridge and other wonderful projects were completed. @Fatcat723 – @Kris0logy – Glad you enjoyed the pictures. Have a nice weekend! The Rama VIII bridge is stunning. It would be very cool to drive on it during the night or day. Beautiful. I remembered riding an evening dinner cruise in Bangkok, beautiful sights. These are gorgeous. I especially like the second one. Those are beautiful! Would love to drive along those. Loved these shots…interesting lighting on the pedestrian bridge. 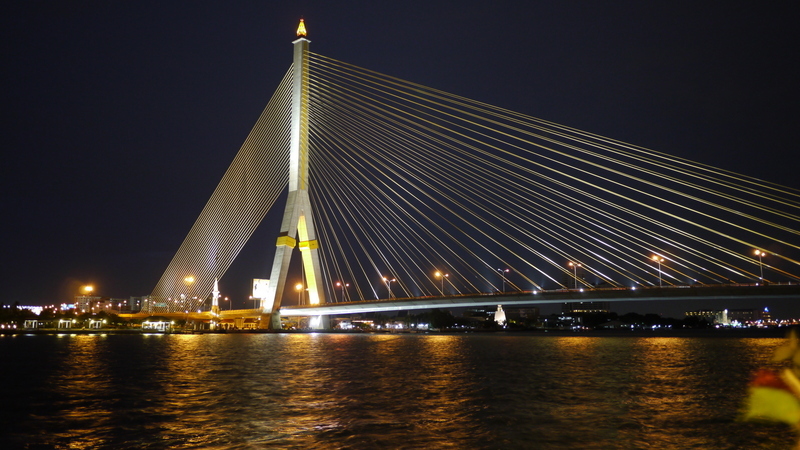 The Chao Phraya bridge is just a beautiful structure, but the play of light add to the interest. Thanks for sharing. The first time I ever enjoy Cincinnati, my hometown, was when I walked across the bridge and saw how beautiful it was from the other side of the river, in Kentucky. Bridges are amazing. Amazing photos. TY for sharing them. @christao408 – I hope your word stays true for my awesome but taken for granted metropolis. Wow — those are really beautiful bridges. They are replacing bridges here — some to widen freeways, and some for earthquake protection — and the lines seem to be very sleek, though not as beautiful as these two. nice shots. are they new? can’t remember them from my past visit to bangkok. or maybe i didn’t pass those areas. @Devilzgaysianboi – The Bay Area has its share of nice architecture, doesn’t it? @rudyhou – The Rama VIII bridge is nearly a decade old but is a bit further up the river than most tourists go. 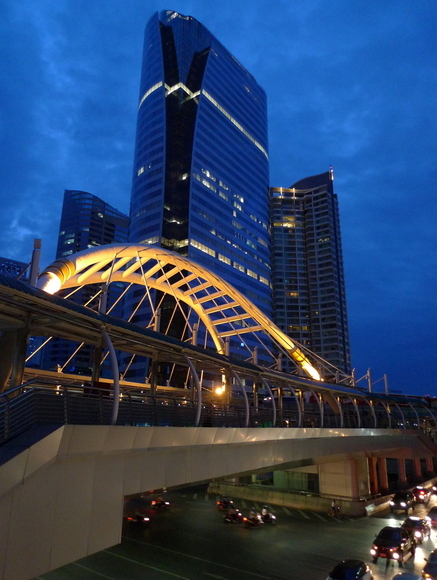 The pedestrian bridge at Sathorn opened less than a year ago so you definitely didn’t see it before. @slmret – There’s a bicycle/pedestrian bridge that crosses the I-80 freeway in Berkeley that is only a few years old and is really pretty. Seems like engineers make at least some effort to consider form as well as function. @armnatmom – The city has changed a lot in recent years. @making_a_comeback_05 – @Grannys_Place – @mizz_chan – @MillySonka – @stepaside_loser – Glad you enjoyed them. @secade – That says a lot, doesn’t it? The importance of crossing to the other side to get a better perspective and appreciation on where we are. These are very nice – I’m glad someone was able to combine form and function. @making_a_comeback_05 – Thanks also for the recommendation. @ElusiveWords – Yes, sometimes it is surprising that an effort is made to have beautiful yet practical designs for public works. @christao408 – ooo…. no wonder.